Cooking the green vegetables in butter will give them a lovely nutty flavour, and the pine nuts add both taste and texture. Place 50g unsalted butter in a small pan and cook gently for 8-10 minutes until it turns golden brown, but take care not to burn it. Meanwhile, cook 2 x 300g packs fresh green beans, trimmed, in a large pan of boiling water for 2 minutes. Add 300g Waitrose Frozen Garden Peas and cook for a further 2 minutes. Drain well and transfer to a serving dish. 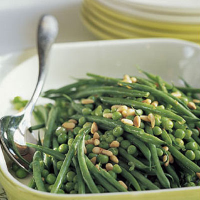 Pour over the butter and scatter with ½ x 90g tube Waitrose Cooks' Ingredients Toasted Pine Nuts. Gently toss together, season and serve warm.